We have also used the Dovecraft Common Creature collection for our tutorial, perfect if your children love farm yard animals. 1. With the score line at the top, draw a fish bowl shape on your card and cut it out. 2. Stick a piece of blue textured cardstock to 13.2cm x 15.2cm and stick to the fish bowl shape. Cut around the edges with a craft knife. 3. Cut a strip of white textured cardstock to 2cm x 15.2cm and stick to the top of the fish bowl. Again use the craft knife to shape the edges. 4. Cut three strips of 10.3cm x 1.8cm green textured cardstock and cut waved edges to look like seaweed. Shape the paper around a pencil to add dimension when sticking them to the card. Add the seaweed to the right side of the card and stick the fish Zoo Buddy next to them. Tip: Use a hot glue gun to stick your zoo buddies to your projects to make sure they stay put! 5. Use the Fiskars lever punch to punch out some of the small circles to create bubbles. Add to the left of the card. 6. Die cut ‘1 TODAY’ using the First Edition Alphabet Die Set and stick to the top of the card to finish. 1. Draw the half of the greyboard hoop onto a piece of blue textured cardstock and cut out. Using double sided tape, stick the paper to the top of the hoop. 2. Cut out strips of green cardstock in a variety of widths and fringe the paper to create blades of grass. Stick and layer to the bottom half of the hoop. Make sure to cover the entire bottom of the hoop and cut off any excess. 3. Cut a 26.2cm x 1.57cm strip from the First Edition brown textured cardstock and stick across the top of the grass. Cut ten 1.5 x 5cm pieces of brown cardstock and cut one side into a point before sticking to the strip of brown card to create a fence. 4. 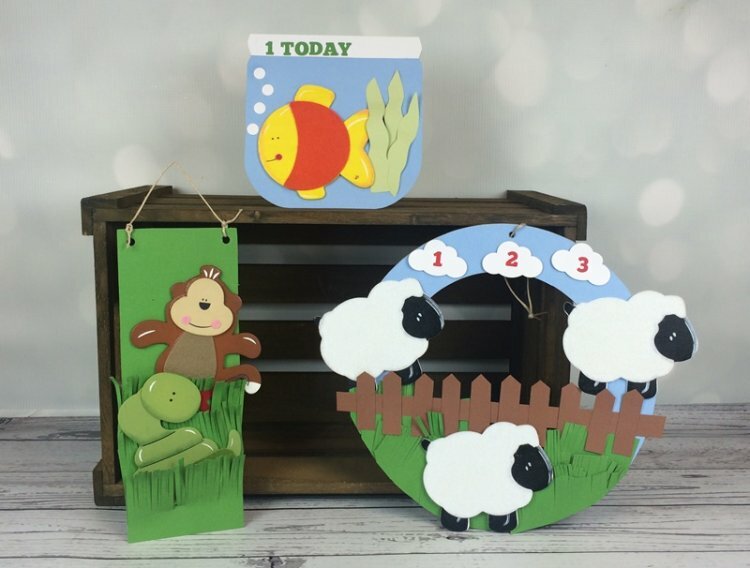 Add two sheep above the fence on each side and add a third zoo buddy sheep to the bottom of the hoop. 5. Cut with three clouds with the Fiskars Cloud Punch and white textured cardstock. And stick to the top of the hoop with foam tape. Die cut the numbers 1, 2 and 3 with red textured cardstock and add to the centre of the clouds. 6. Punch a hole at the top and feed a piece of SANTORO®'s Willow Jute through and tie a knot. 1. Cut a piece of grey board to 24.1 x 9.1cm. Cut a piece of green textured cardstock to the same measurements of the greyboard and stick on top. 2. Cut three pieces of green cardstock to 6.8 x 9.1cm and fringe the card to create grass. Stick and layer to the bottom of the grey board. 3. Add a snake zoo buddy in between the bottom layered grass and add the monkey zoo buddy under the top piece of grass. 5. Add a name to the top to finish. Have you used these wooden and felt creatures in a unique way? Share your creations in the project gallery or comment below with your suggestions!